Spicy Tuna Sushi- 7.95, Unagi Sushi- 12.95, Salmon Roll Sushi-6.95. 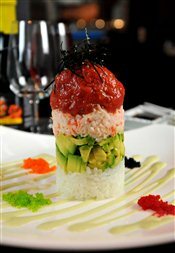 Milled tuna in a spicy marinage with crab meat, avocado salad, various flying fish eggs & a sushi rice foundation infused with creamy wasabi sauce. Sliced pork and assorted vegetables marinated in a spicy garlic sauce, served with Boston lettuce, miso sauce and choice of white or brown rice. Crispy on your ear and sweet on your tongue!! Fresh avocado & cucumber harmonize with crunch shrimp tempura & crab meat plus the spicy salmon, top with sweet & spicy crispy crunch.